for pleasuring Tommy Lee Jones? It wasn’t The Avengers, The Amazing Spider-Man, or even The Dark Knight Rises that most held my rapt attention this summer movie season. No, the thrill of watching two luminous American thespians exhibit the craft of acting in Hope Springs beats all the CGI pyrotechnics money can buy. After 31 years of marriage, the everyday for Kay (Meryl Streep) and Arnold (Tommy Lee Jones) is a monotonous cycle of silent meals and sexless nights spent in separate bedrooms. When Arnold isn’t dozing off in his recliner using the Golf Channel as a sleep aid, he’s concocting feeble excuses to rebuff his wife’s timid advances. 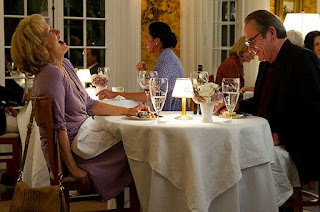 At her whit’s end, Kay cashes in her CD and enrolls her and her skeptical husband in an intensive one-week program run by Dr. Bernard Feld (Steve Carell), a published marriage counselor nestled in the titular, oh-so-quaint Maine village (Connecticut substituting). Carell proves his acting mettle by, ironically, being smart enough to back off and simply moderate Steep and Jones’ exquisite, poignant and often wrenching dissection of a marriage gone stale. Thematically, Hope Springs is a senior-circuit adaptation of “Fireproof” without the religious pablum. And, I could have done without the repeated forays into a PG-rated, geriatric take on “50 Shades of Grey.” Still, the film dares to tackle head-on the dearth of emotional and, yes, physical intimacy in long-lasting marriages that subsist on comfort and routine, sometimes enduring for their own sake. Such seriousness blended with comic grace notes could have gone horribly wrong in less talented hands. But, Streep and Jones make you feel the pain, embarrassment and stubbornness often standing in the way of the spiritual and sexual healing process. If Hope Springs proves anything, it’s that age ain’t nothing but a number.